This is the classic FluidImporter. 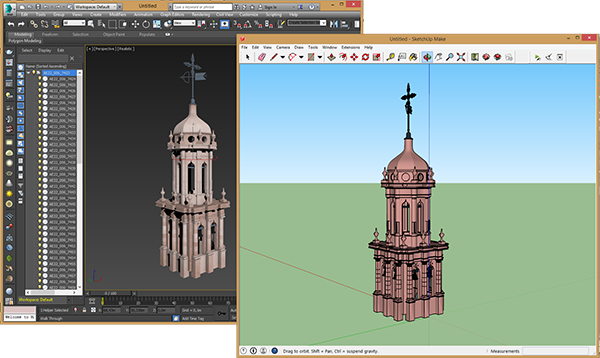 Quickly imports Alias Wavefront .obj files into SketchUp. For more file formats, check out FluidImporter Pro. The definitive import solution for SketchUp. Quickly imports Alias Wavefront (.obj), FBX (.fbx), STereoLithography (.stl), DirectX (.X), Stanford PLY (.ply), Collada (.dae), 3DS (.3ds, .ase). To import a file in SketchUp, go to the menu Extensions -> FluidImporter -> Import, then select the file to import. You can change the import options by going to the menu Extensions -> FluidImporter -> Options. Note: on some older versions of SketchUp, FluidImporter can be found under the menu Plugins -> FluidImporter. For extra help, check the FluidImporter forums.